Elevators are highly functional and are have various applications such as vertical lifting of materials such as coffee, rice, food grains and other granular materials. Construction : Designed like a construction box with standard length leg sections for easy assembly. Sections : It has three sections - top or discharge section, middle or trunk section and the bottom or intake section. The trunk sections can be added or removed to adjust the height of the elevator. Frame : It has an all-steel frame for rigidity with cross supports at regular intervals between the legs also doubling as built-in ladders. Belting : The belt has been made from white food mounted rubber coated, multi-ply synthetic fiber. Buckets have been attached at regular intervals and run over top and bottom crowned pulleys. Buckets : Buckets have been created from deep drawn steel of adequate gauge that is attached to the belt by locking type bolts that sit flush with the belt face. 3 Phase Motor : It is provided with an enclosed Imported Italian Gear Motor. All bearings are of the Universal Flange Cartridge type which are known for their lifetime lubrication. On-site increase or decrease in height possible. Self lubricated bearings ensure less maintenance. 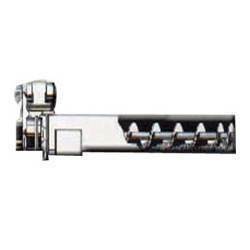 Easy to maintain since hinge type door in the elevator leg is provided. Deep drawn steel buckets for longer life. Our offered range of Screw Conveyors is well admired by the clients due to their durable shelf life, sturdiness, simple setup and high performance. These are offered with flights which are designed to ensemble materials being conveyed. These are provided with sturdy hangers and end bearing housings. 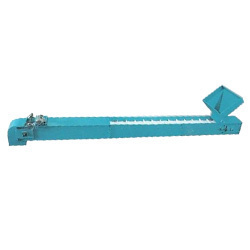 We are counted as the leading manufacturer & supplier of Belt Conveyors which are widely utilized in several applications depending on the material to be conveyed, location, capacity and others. These are developed with flat or thorough through idlers, inclined or overhead, with tripper, screw take-up or gravity take up. These are well known for their durable life, rust resistance and minimal maintenance. 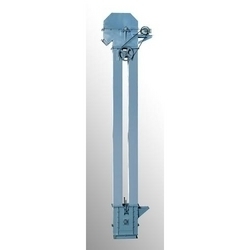 This range of Bucket Elevators which we offer is available in various constructions such as centrifugal discharge, gravity discharge, spaced buckets, continuous buckets, belting or carbon steel chain, single or double legs construction. Made of high graded materials, these are facilitated with screw take-up, self cleaning bottom pulley, crown design head pulley, rubber legged, sturdy casing and many more.